I ordered on mid-march a Surface Pro 4 with a Core i5, 8Gb RAM, and 256 Gb SSD. I added a Black Type Cover, and a docking station. It was ordered on a Wednesday on Amazon, and next day it was delivered. I basically opened it and plugged in the charger and started the configuration (I have a low bandwidth connection at home (2M at peak), so assuming it would take a while to download everything, I would use the Surface Pro 2 until Friday evening, while the Surface Pro 4 got updated. One thing that I didn’t like during the configuration was that I had to set my start menu: compared to Windows 8.x which reproduced it on each device, it is not the case with Windows 10, which I find odd, as I really appreciated to have that synced between all my devices. At this small exception, the setup experience of Windows 10 is as you expect quite streamlined and efficient. The cherry on the cake is Windows Hello: it setup assistant guided me to set it up right after the association of the machine with my Microsoft account, followed by the setup of a pin code as a backup (just in case it doesn’t work as expected). And Hello facial recognition works very well, with or without glasses, being in the dark or in the light (I guess the problem will be to remember the password on the long term for many people…). Two display ports instead of one. Before, to plug 2 screens, you were required to use screens compliant to DP 1.2 MTS standard, and chain the second one behind the first one. Now this is still possible, but you can also use one display port on the station for each screen. The angle of the tablet is no longer fixed. The connection between the dock and the tablet is done by the cable and not by the docking station itself. As a result, you can now use the tablet to draw on it as you are not tied to a single inclination while docked to the station (this was among the main concerns I had with previous Surface docking stations): as a result, a Surface Pro 3 or a Surface Pro 4 can now be used for graphic inputs, similar to what you would be doing with a Wacom Cintiq tablet. 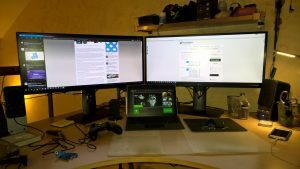 On the desk, with the two screens, it almost fully replaces a desktop (the desktop has been now re-purposed and specialized as gaming rig – and it is its only use). My former SP2 was also used in this configuration with less RAM and less SSD space and the Surface Pro 4 only does better in this area. There was a noise concern during the few first weeks of use, with the fan kicking quite often, but this changed during last week of April with the last firmware and drivers update. It is no longer the case, and the fan became rare, and when kicking in, barely audible. And Windows 10 makes use of multiple screens just great with the improvement made on snapping modes (edge of screens act as magnets for the windows when you travel them on the screen, making the positioning of a windows quicker – something the ones using only one screen will never notice). But I did not choose my Surface Pro 4 for a desktop only purpose… Let’s talk about mobility now. And let’s put first a disclaimer about my previous device: In the past while I used my SP2, I found it too heavy for my note taking, and I bought an additional 8 inch Wacom enabled windows 8 tablet which became my specialised note device (with the second rationale that it could be a backup device, just in case). As a result, you will finally consider that even without taking notes, the Surface Pen is bringing something key. Better: you can even set the actions of the eraser button to something else. But to come back on the note taking or drawing experience, the precision of the new pen is greater and the feel is perfect: the experience approaches what you may feel writing on a paper. The last generation of Type Cover is much better than the previous generation. It is more rigid, the typing experience is better with a good travel of the keys (better than on recent Macbook), and it finally comes with a great touchpad with glass surface and the size seems to be a very good compromise, while the sensitivity would be similar to what you would expect from a Macbook. It is so good that I sometimes forgot to switch my Bluetooth mouse on, which is something that never happened with my previous machines. Prefer Store application versus equivalent desktop applications : most legacy desktop Windows application have not been designed with battery life in mind. I still have both available on the machine f. However, I would use the desktop version only once plugged in. The Surface Pro 4 is my perfect mix of laptop, convertible and tablet. It works perfectly for my use, it is versatile and provide a good battery life and it definitely reduced the number of devices in my bag. At the end, I have only my Surface Pro 4 in it, and that is probably the best conclusion I can provide for this test.